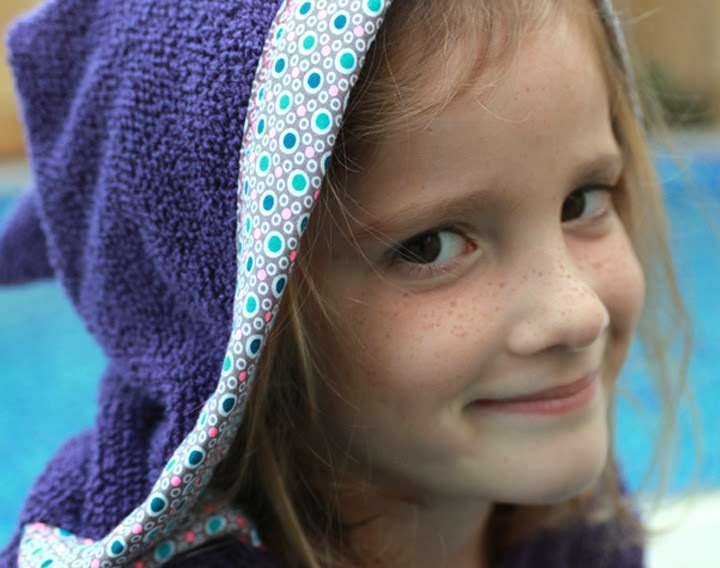 Bathrobes for the children are probably the item the longest on my to-do list. 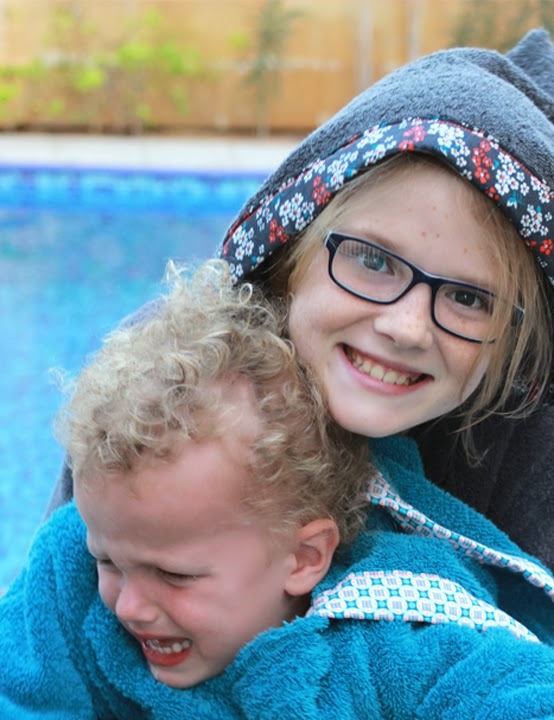 It was getting urgent, as some mothers at after school swimming already accosted me about the size of the bathrobes of –especially- the boys. 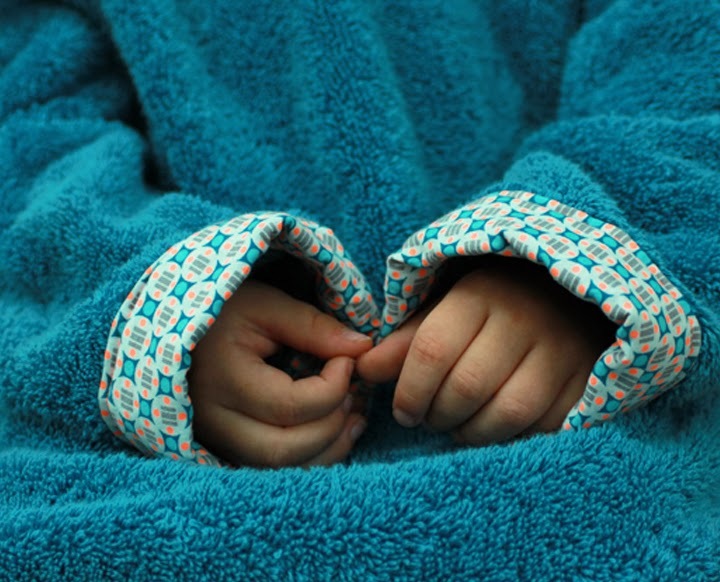 The label of their bathrobes said ‘size 18 months’ so at the age of 7 years old, it goes without saying that they were (far) too small and (far) too short. 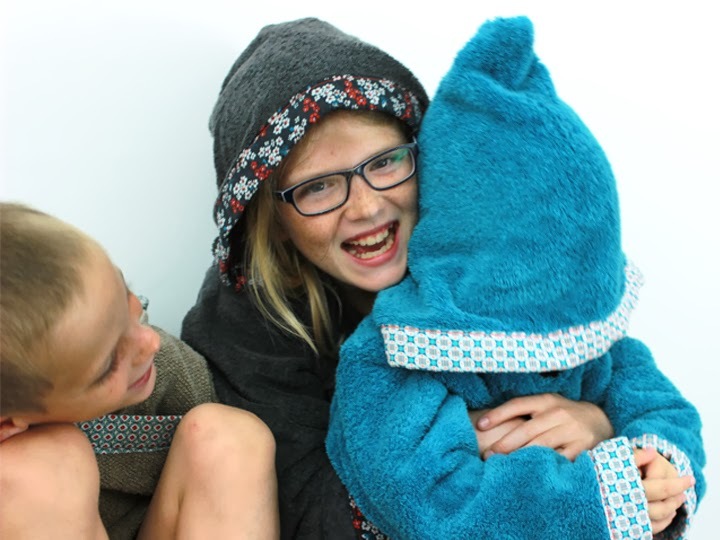 KCW Winter 2014 was the ideal motivator to finally make 5 bathrobes. 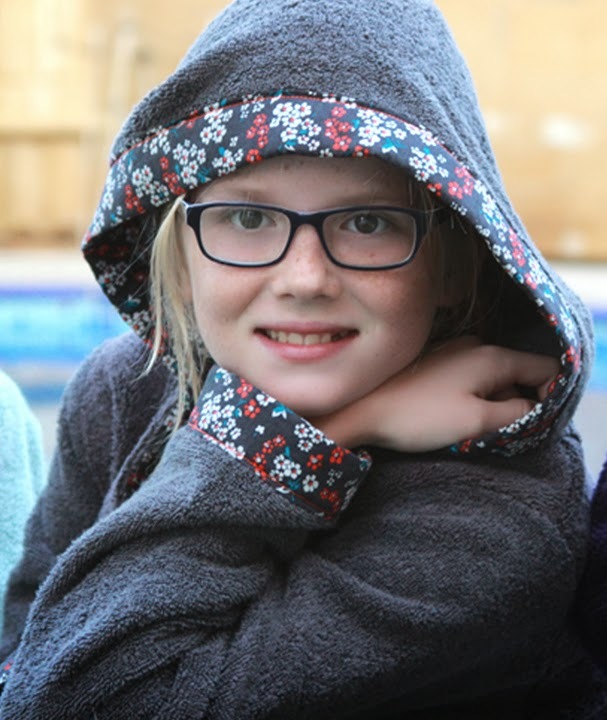 Our children don’t like the rope that closes most bathrobes, so I decided to make a burnous – an Arabic style coat amongst others worn by camel herds. While going through ‘Intemporels pour enfants’ we found exactly what we had in mind, which saved us the process of drawing/testing our own pattern. We added a wide, decorative band to all openings and to the hood, this is not described in the original pattern. 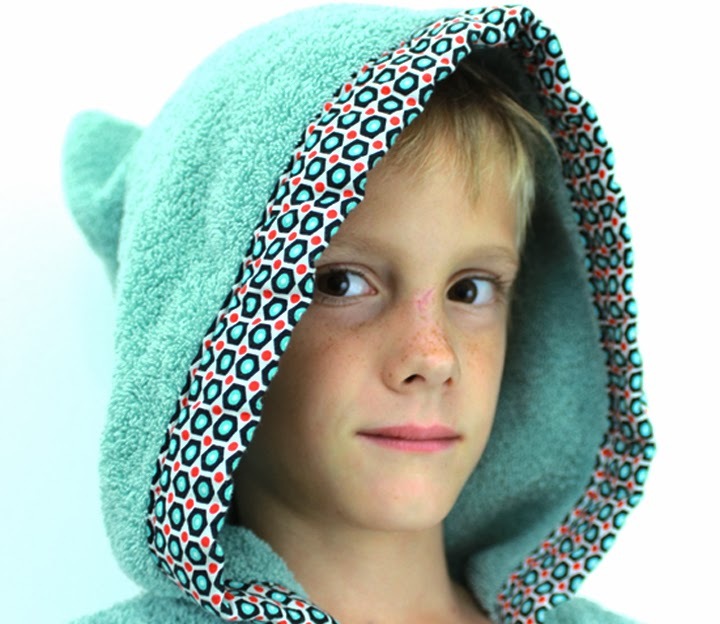 All children got their own color bathrobe, decorated with a matching Petit Pan trim. The burnous are rather large so we can use them hopefully for a couple of years. As usual Felix boycotted the photo shoot! We tricked him into it anyway, so –by the time the other kids were tired of taking pictures- we got a scarce picture without tears. Pattern: The book Intemporels pour enfants from Astrid le Provost was bought @ Kinokuniya in Dubai Mall. Fabric: Good toweling is hard to get in the UAE and ordering online results in high delivery costs because of its volume so we cut up good quality towels (2 per burnous). 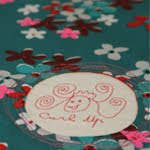 The Petit Pan fabric was bought @ the online Petit Pan store. Amazing! 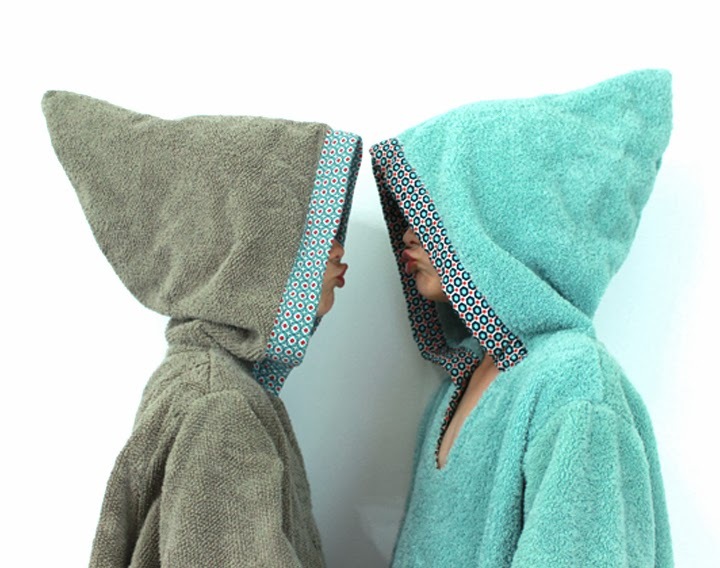 These are the best swimming robes ever. These are fantastic! I love that photo of the two boys leaning at the same angel - perfect! And that's ambitious, to make 5:) Way to go! Perfection. I need to start some of these now! These are fantastic!! I wish this book was in English! I can't find it if it is... Looks like a fun book!